This is the story of my return to high school. This is the true story of how I didn't die. "Etler's gutsy present-tense narration of her feelings of insecurity and isolation is interwoven with the sublime moments of joy she experiences in music, in writing, and in her relationships; her prose dazzles with infectious verve. A powerful story of a survivor whose irrepressible personality shines throughout even her darkest moments. "This is a gritty, hard-hitting, and, for many readers, unfortunately necessary exploration of what's really behind the lures of self-destructive behaviors, and what real recovery is and isn't. A brave book. I received a free copy of this book, and did not know what to expect. It is a brutal and horrific memoir, and there are no doubt many trigger warnings attached to it. I have read through some of the reviews, and many talk about the horrific cult-like 'rehab' program. The takeaway for me was victim-blaming. This happens to Cyndy throughout - by her mother, her 'friends', her mentors, strangers. She is labelled (incorrectly), forced into rehab because her mother (who seems mentally ill) can't deal with her attempted suicide, brainwashed, and then shamed and blamed for every single thing that happens to her, including being raped repeatedly when she was a child. This is not a story simply about survival or designed to shock. It is a critical examination of our society, and what we STILL perceive as normal and acceptable. What happened to Cyndy was in NO WAY her fault. Victim-blaming needs to end. AMAZING book - recommend for any teen or parent going through the struggle - ANY struggle - drugs, eating disorders, social, academic, family, abuse, trauma - the author's story is at once tragic, funny, uplifting, and ultimately hopeful. If SHE got through all of this as a teen, ANYTHING is possible for us and our kids. It's an easy read as well - she gets the point across about difficult moments without pulling the reader into the darkest, scariest, most depressing moments which I really appreciate as a mom. I recommend this book because if you're looking at this book and reading my review, you know already that there are WAAAAY too many details that are currently happening in your family life that you may not be able to share with anyone. Being a parent with a teen who struggles is isolating, because every other parent you're likely to run into is a dedicated cheerleader and PR agent for letting the world know how amazing/talented/successful/funny/brilliant/well balanced their perfect child is. Trust me - they are leaving out a lot of the uglier details when they recount the semester's highlights. This book reminds me that I'm not alone in my struggle as a parent and more importantly, it lets me know that no matter how crazy and difficult things are today, it will all turn out ok. Things will get figured out. It won't always hurt as much as it does today. 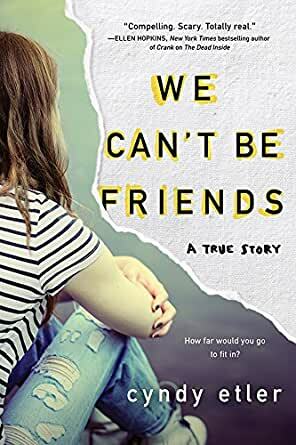 From social drama at school to dysfunction at home, Cyndy Etler's story is honest, funny, engaging and authentic and I can't imagine navigating my teen's current set of issues without the context, wit, hope and laughs this book provides. 5.0 out of 5 starsOne of the most important books you will read. Beautifully written. Cyndy Etler is a true artist with the pen. While her story is horrific and frightening, she manages to provide humor and insight into her experiences. This book is extremely important, as it gives children and teens, and especially sexual assault victims, a voice that they don't otherwise have. Hopefully parents and caretakers (teachers, administrators, etc.) will listen to her story. And you will also understand why "we can't be friends". I read the first book and it was pretty good. This one is good but a lot of it is just 'things happening' and no real direction. I love love love books and love reading but this wasn't as awesome as I thought. First book was better. I still recommend it for closure after the first book and she is a good writer... just didn't love the book.